PCE Instruments (PCE) offers a number of thermal imager products for use in home, electrical and machine inspections, security applications and more. Each PCE-branded thermal imager camera features a user-friendly interface, so you don't need to be an expert to capture and analyze thermal images. The various thermal imager models offered by PCE are smaller, more durable, easier to use and more economical than traditional thermal imaging devices. Each thermal or infrared imaging camera has a streamlined design that allows for the utmost convenience in portability. 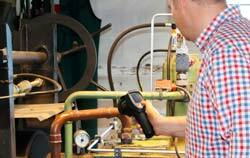 Taking infrared measurements using a thermal imager allows for the detailed analysis of a particular scenario. Thus, the possible uses for a thermal imager are extensive. For example, a thermal imager is a useful tool for inspectors, security personnel, builders, architects, electricians, HVAC technicians, engineers, scientists and researchers. Thermal imaging devices help law enforcement professionals and investigators to determine the infrared characteristics of various forensic materials. Thermal imagers also are used by mold remediation specialists to detect temperature variations behind walls, as cold spots can indicate potential moisture. Once a cold spot is located, a moisture meter is used to test the area to confirm the presence of water.. The Thermal Imager PCE-TC 28 was designed for taking non-contact temperature measurements. To get accurate readings, the emissivity of the thermal imager can be adjusted, depending on the operation purpose. Besides taking infrared images, the thermal imager can also take normal pictures, as well as a mixture of both, due to the built-in digital camera. The thermal imager PCE-HDM 20 is a universal measuring instrument. The thermal imager PCE-HDM 20 allows a variety of measurement projects. This makes it easy to investigate current, voltage, capacitance, frequency and resistances. The thermal imager PCE-HDM 20-ICA is a universal measuring instrument. The thermal imager PCE-HDM 20-ICA allows a variety of measurement projects. This makes it easy to investigate current, voltage, capacitance, frequency and resistances. PCE-TC 29 is a thermal imager camera used for visual inspection and non-contact infrared (IR) temperature measurement. Ideal for industrial use in electrical, mechanical, and building installations (such as in the auditing of machines, engines, or heating, ventilation, and air conditioning (HVAC) systems), this affordable thermal imager captures and saves 60 x 60 pixel IR resolution images to the included MicroSD card memory. PCE-TC 34 is a thermal imager camera used for visual inspection and non-contact infrared (IR) temperature measurement. Ideal for industrial use in electrical, mechanical, and building installations (such as in the auditing of machines, engines, or heating, ventilation, and air conditioning (HVAC) systems), this high-definition, high-resolution thermal imager captures and saves 640 x 480 pixel IR resolution images to the included SD card memory at a refresh rate of 50 Hz. The thermal imager PCE-PI160 is a radiometrical scanning infrared camera system, designed to capture and display temperature- based images and temperature profiles of objects. The thermal imager PI160 fulfills highest technological standards: Not only it is equipped with a 2.0 USB interface, but it also features a real-time imaging of 120 images per second. The thermal imaging camera PCE-PI-200 is a fully radiometric operating infrared camera system to capture and display thermal images and thermal profiles of objects. The thermal camera PCE-PI-200 incorporates latest technology due to an USB 2.0 interface that allows a real-time thermal imaging with 128 images per second and simultaneous real time images with 32 HZ as well as stationary and portable operation that is very well priced. The thermal imaging camera PCE-PI-230 is a fully radiometric operating infrared camera system to capture and display thermal images and thermal profiles of objects. The thermal camera PCE-PI-230 incorporates latest technology due to an USB 2.0 interface that allows a real-time thermal imaging with 128 images per second and simultaneous real time images with 32 HZ as well as stationary and portable operation that is very well priced. The thermal imager PCE-PI 400 is a fully radiometric operating device for recording and display of temperature-based images and temperature-based profiles of the object in operates on. The thermal imager PCE-PI 400 does not only work with the latest technology due to its USB 2.0 interface, which allows a real-time thermographic imaging with 96 images per second and simultaneous image-recording with 32 Hz, but it also efficient due to stationary as well as portable application. The thermal imager PCE-PI 450 is a fully radiometric operating device for recording and display of temperature-based images and temperature-based profiles of the object in operates on. The thermal imager PCE-PI 450 does not only work with the latest technology due to its USB 2.0 interface, which allows a real-time thermographic imaging with 96 images per second and simultaneous image-recording with 32 Hz, but it also efficient due to stationary as well as portable application. First of all, before purchasing a thermal imager, it is necessary to clarify for which application the measuring device is to be used for. 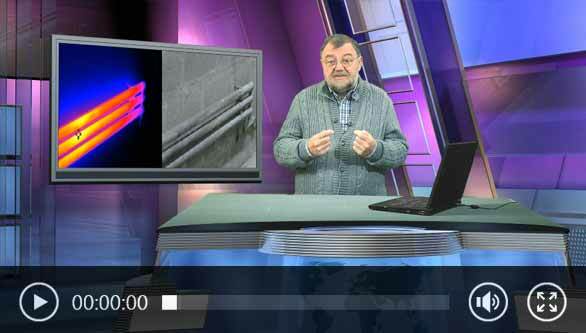 Therma imager with a lower resolution should not be used for precise temperature measurement. Therma imager with a VGA resolution could be used for easy temperature control, but practically, this does not make sense, since the devices of this kind has not been designed for such an application. What resolution is required for which application? Low resolution, for example, 38x38 pixels: Therma imager with a very low resolution as the PCE-TC 28 are used for simple temperature tests. The cameras almost replace a pyrometer. They are a better infrared thermometer with the advantages of a real thermal imaging camera. The measuring instrument can be perfectly applied to test the temperatures of fuses and electrical assemblies in control cabinets. Or also for simple and point temperature measurements. Furthermore, these thermal imager can also be used for the rapid control of water pipes, pumps, bearings and gearboxes. Many of these thermal imeger have a SD card memory, so images and videos can be stored for documentation purposes. 160 x 120 pixels medium resolution: Thermal imager with a resolution of 160x120 pixels can be used for more demanding measuring tasks. With these thermal imaging cameras the thermal bridges on buildings can be searched and found, or the component temperature can be measured in the electronics development. Thermal imager with a high resolution: for the infrared cameras of this class the thermal resolutions starts from 640x480 pixels, what corresponds to the default VGA-resolution. Also these thermal imager also have documentation possibilities. Due to the high pixel density, much better thermal images can be recorded. Thus, a much better picture quality is achieved. Is a real image required? Some thermal imager offer the possibility to record a visual real image in addition to the IR image. This means nothing else but that the camera can record the images in the visible spectrum and in the infrared spectrum. Cameras with a second real-image camera offer the user the possibility to place the infrared image continuously or stepwise over the real image. This makes the assignment of the heat sources easier and facilitates the daily work. Should the thermal imager be for mobile use or fixed installation? This question is fundamental and irreplaceable for the choice of the thermal imager. For sure, it is possible to use a camera, which is designed for stationary installation, in which the thermal imaging camera is connected to a laptop via USB, also as a mobile device. The other way round, it is much more complicated to use a mobile IR camera for a stationary application. Not the least important reason for this is the design and construction of the camera. Infrared cameras for stationary applications such as those of the PCE-PI series have small dimensions and no own display. As a result, these infrared cameras can be easily mounted on machines and in places which are difficult to access. Furthermore, these cameras have the possibility to be controlled via USB or network. Thus, a continuous monitoring of a process is possible without any problems. A handheld camera cannot be used for online thermography just like that. Frequently, the software of mobile cameras offers a perfect documentation possibility, but cannot be used for online measurements because the image is not transmitted live. You need to clearly understand this, before purchasing your camera and select the infrared device carefully. Our consultants are ready, even on telephone, to assist you in making a decision when selecting the camera. They help you when you have specific questions about the infrared cameras and whether certain functions are available. Infrared measurement consists of capturing an image to make visible the heat radiation from an object, invisible to the human eye. This measurement doesn't require contact with the device and the camera can record events such as explosions, fires and the course of movements. Infrared measurements can be recorded to produce a scheme of temperature measurements of an area. Infrared images illustrate the heat emitted by objects, machines, buildings, etc. Thanks to thermal imaging you can have an idea about the loss of infrared heat or determine heat sources. To guarantee quality, thermal imaging is becoming more frequent as in installing insulation during the construction of a building. This allows to locate problems without causing damage to the building. Our thermal cameras are suitable for these situations. 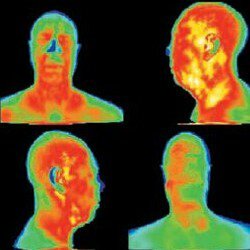 Thermal imaging cameras provide us with a thermogram, a representation in color of radiation differences in objects. Since infrared radiation is a parameter related to temperature, a thermal inspection is used to discover differences in materials temperature. This allows for the thermal imaging cameras to be used in diverse fields, for instance in a building, because both heat loss and isolation are key elements for a building efficiency and comfort. This type of thermal imaging cameras may be of interest to builders, architects, consultants, promoters, management. With a thermal imaging camera you can check heat loss in houses caused by air infiltrations through junctions between roofs and walls. Thermal imaging cameras can be also used to detect humidity and damages caused by water, such air humidity on a roof caused by a leak. Thermal properties of water enables to detect humidity by thermal imaging cameras under certain conditions. Thermal imaging cameras can be used in various fields (checking roofing and coating status, calculation of thermal transmission in surfaces, inspection of dry processes in materials, heating and cooling systems operation, domestic electrical risk assessment) and in applications where the differences of temperature provide important information. Thermal imaging cameras are like normal cameras but they can register light reflected by an object. Thermal imaging cameras are heat sensitive devices which show images depending on their temperature, so thermal imaging cameras are especially useful in dark environments. Thermal imaging cameras display objects depending on their temperature, hotter objects are brighter. 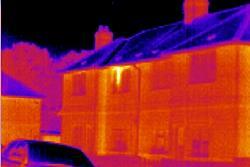 Thermal imaging cameras use very sensitive systems which can measure temperatures up to a fraction of a degree. Thermal imaging cameras were firstly used during the Severe Acute Respiratory Syndrome (SARS) in 2002 and 2003 in the airports of Singapore and China. 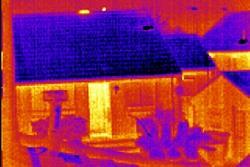 Since then, thermal imaging cameras have been continuously used. Although thermal imaging cameras can detect high body temperature, they cannot detect human swine influenza. Any traveler exposed to any effort (running, carrying excessive weight, drinking alcoholic drinks together with an excessive heat) may present an increase in body temperature. 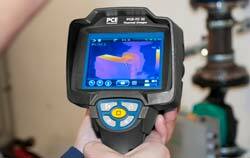 Thermal imaging cameras PCE-TC series have a software which allows for the detection of any heat source. With the help of a temperature calibrator and programming it at 38 °C for example, you could check if the thermal imaging camera detects temperature accurately. The software of the thermal imaging cameras emits a visible alarm to the PC when the thermal imaging camera detects a higher level of temperature. This way, a high accuracy is assured. 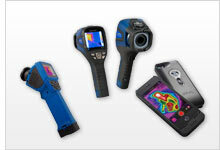 These thermal imaging cameras combine visible and thermal images to create a person's "heat picture". With this image you can see a display at the rear of the camera as in the standard digital cameras. A cursor automatically points the hottest area of the image, normally the person's face. It is better to check people one by one. Thermal imaging cameras were originally used within the military sector. When the technology of thermal imaging cameras advanced, they started to be used in more fields of application military use, predictive maintenance, control of processes, detection and analysis of fire, inspection of floors, insulation, walls, etc as well as in medicine. Most damages in the industrial sector both electrical or mechanical can be previously detected by changes of temperature by thermal imaging cameras (fixed cameras for continuous control or handheld cameras for spot checks). The use of the thermal imaging cameras in the maintenance of installations, machines, etc makes it possible to detect future damages and avoid their consequences. At purchasing a thermal imaging camera, the customer should take into account: number of pixels, spectral sensitivity, sensor life, field of view, dynamic range, input power, mass and volume.